What do you mean Diversity? The Wikipedia Diversity page lists variety in Diversity – cultural, gender & functional diversity to name but a common few (neurodiversity to name a less common one). It describes practices of Diversity Politics and Diversity Marketing. You could have easily stereotyped any one of them: the office joker, the meeting troll, the fat one at the coffee machine, the midnight owl IT developer, the eccentric CEO, the antagonistic Network Engineer, the philosophical janitor, the worrisome HR director, the stubborn project manager, the persistent pre-sales consultant, the introverted developer, the thick-headed IT-director, the car-freak CFO, the aggressive competitor. Individuals, with whom I met, shared, debated, discussed, disagreed, engaged, did business with or lost deals from. Each of them, in their own right, special, individual, diverse. Some of them quirky or weird, unpredictable to the point of predictability. Most of my attempts to stereotype them have backfired. If I have learned anything, it is the need to step beyond the stereotype. To challenge any assumption we may have shared. To accept them as individuals. To understand the Diversity program they belong to. To nurture my open mind. My hobbies and pastimes include quirky habits like close-up magic and squash. Weekly Yoga with the missus. Writing occasional pieces on social media. I tend to get passionate about Data. Self-confessed nerd. Neighbourhood philosopher. Married with kids. None qualify me (*) as target to any Diversity program on Wikipedia, still the whole tells a unique and diverse story. I believe you cannot choose not to be an individual (**), but as an individual, I can choose to embrace Diversity. I can choose to cultivate an open mind. Simply because it has proven key to my personal development, happiness and business success. So maybe that is how it is? 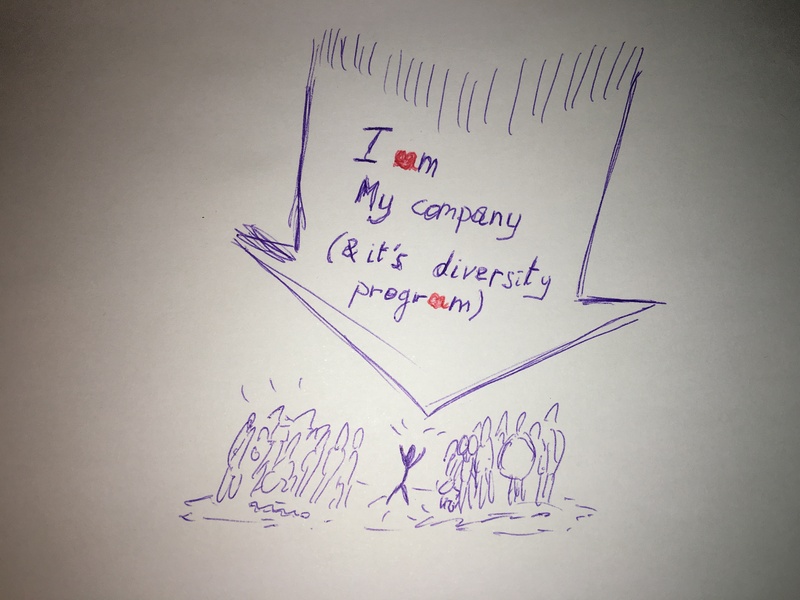 There cannot be Diversity in my company – unless I accept my part in its Diversity program. (*) neither does being a slightly overweight 40-something white (heterosexual) father of two living in the suburbs, but I try.